This post has 12,354 views. This is probably the last article I’ll write about my experience at the University of British Columbia. UBC has been a pretty good place to me, and so I decided to write a little guide about my Alma Mater. There is a bit of general information about UBC, but a lot of this post is focused on things that I found interesting and relevant through my five year experience at the institution. As such, this is far from a comprehensive guide to the university. More information can be found in UBC’s website, Wikipedia, and the other links contained in this post. Panorama of UBC’s central area on Main Mall. The University of British Columbia (UBC) is a large public research university located in Canada with campuses in the Metro Vancouver area and Kelowna, British Columbia. 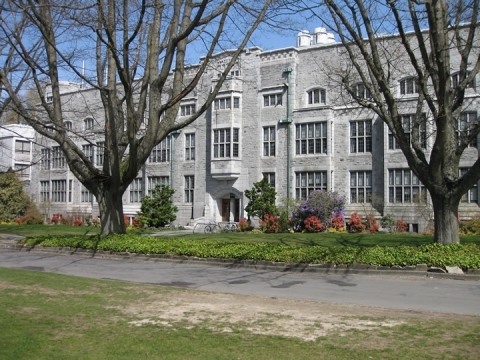 It is the oldest university in the province of British Columbia, having been created in 1908 by the University Act. With over 50,000 students in total, UBC is one of the largest Canadian universities and also one of the most well-known. UBC tends to rank well in publications, usually in the top three within Canada and the top 40 in the world. By most publications it’s a pretty decent university to attend. The view to the north, with greenery, the sea, the mountains, and the blue skies. UBC’s main campus (which I attended) is located on the University Endowment Lands at the western tip of Vancouver, near Point Grey and to the west of the wealthiest neighborhoods in the city. 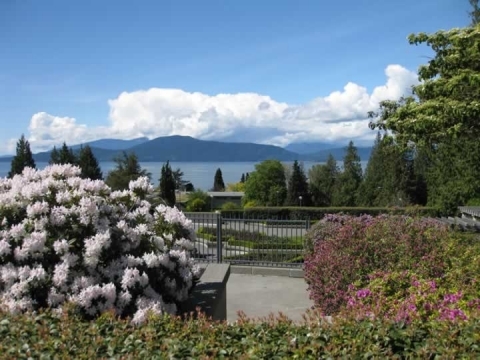 The campus is surrounded by the woods of Pacific Spirit Regional Park, has access to beaches and the sea to the west and north and views of the North Shore Mountains to the north. In other words, UBC occupies the best piece of real estate in the entire Metro Vancouver region. The Point Grey campus is a big place. Walking at a brisk pace, it takes about 15 minutes to go from the southernmost point to the northernmost point. The walk is fine during the days when it doesn’t rain, but it becomes hassle when it rains or snows. Vancouver has a really nice summer that’s usually sunny, but unfortunately most students go to class during the fall/winter/early spring where it rains almost constantly. It doesn’t rain hard, but there are frequently showers and gray skies. In the snowier regions of Canada, a lot of universities have underground tunnels connecting the buildings, but that’s not the case in UBC, so rain or shine you’ll have to walk outside. When it rains, walking becomes an exercise in avoiding puddles, and when it snows it becomes an exercise of trying to stay upright. Fortunately it doesn’t snow very much in Vancouver, but the rain is unavoidable. It really pays to invest in some good rain gear if you are planning to attend UBC. The chemistry building. It’s one of the oldest buildings on campus and the few that has the classic architecture. The Koerner Library, one of the most recognizable buildings in UBC. It’s one of the newer buildings with lots of glass and metal. Looks pretty decent. The UBC campus is beautiful in that there is a lot of greenery and woods and is close to the sea. Vancouver is a pretty good region for gardening and there are a lot of flowers all around campus in the warmer, sunnier months. In the summer, the Rose Garden is an especially good place to visit; you can get a view of the sea and the mountains in addition to the many varieties of roses. UBC is also quite nice during early fall with the the bright colored leaves of the deciduous trees. Compared to the trees and flowers, UBC isn’t quite as good when it comes to the architecture. Since the campus is less than 100 years old, it doesn’t have many of the old, classical buildings that you find in universities with more history. There are a few newer buildings such as with lots of glass and metal which aren’t bad, but there are also a good number of 30-40 year old buildings that are concrete-bland and/or are beginning to show their age. As a whole though the Vancouver campus has a pretty good environment, especially when it’s not raining. The Civil Engineering Labs. It gets my vote as the ugliest permanent building on campus. I know it’s supposed to be an utilitarian warehouse, but what’s with the “Rusty Hut” look? No offense meant to civil engineering students or staff though. In terms of student demographics, UBC follows the trend of many major universities in that it has a bit more female students than males. This is true for most faculties with the major exception of Applied Science and perhaps Forestry. Based on my personal experience at UBC, nearly half of the student population consists of Oriental Asians (Chinese, Japanese, Korean etc. ), with most being Chinese. Chinese people like to go to universities, and Metro Vancouver has a significant population of Chinese people. White people make up the next largest group at around 30-40% of the student body. The third largest group is probably the Indo-Canadians, as they have a sizable presence within Metro Vancouver. The rest of the student population is made up of all the other ethnic groups, including Southeast Asians (Filipino, Malaysian etc. ), Middle Eastern, and blacks. It is a very diverse student body, and there are a lot of multicultural organizations and activities on campus. Panorama of UBC’s engineering area from on Main Mall. As an engineering graduate, I should write a few words about my own faculty. 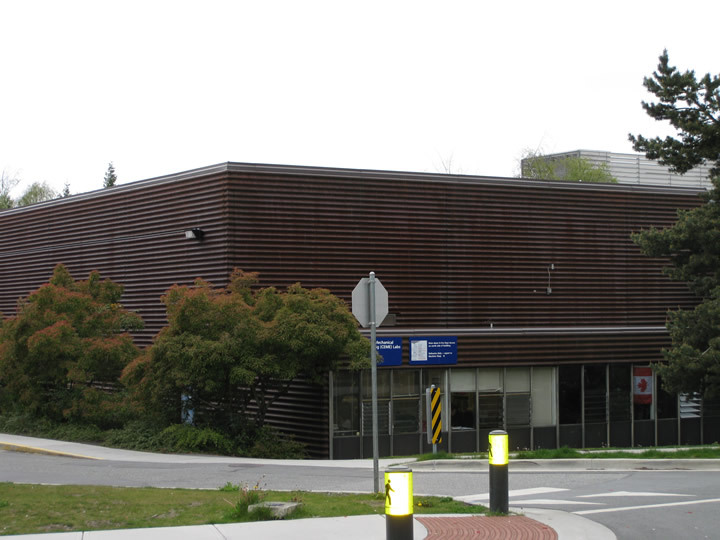 The Faculty of Applied Science is the third largest faculty in UBC, behind Science and Arts. It is one of the few faculties/schools in the university that is still male dominated, although more female students are choosing to join every year. Even though “Applied Science” is used synonymously with “Engineering”, the faculty also includes the School of Nursing and the School of Architecture. However, the engineers are the mainstay of the faculty. There are six departments of engineering (electrical and computer, civil, mechanical, mining, chemical/biological, and materials) plus a slew of other engineering programs (engineering physics, geological, environmental, integrated and biomedical). 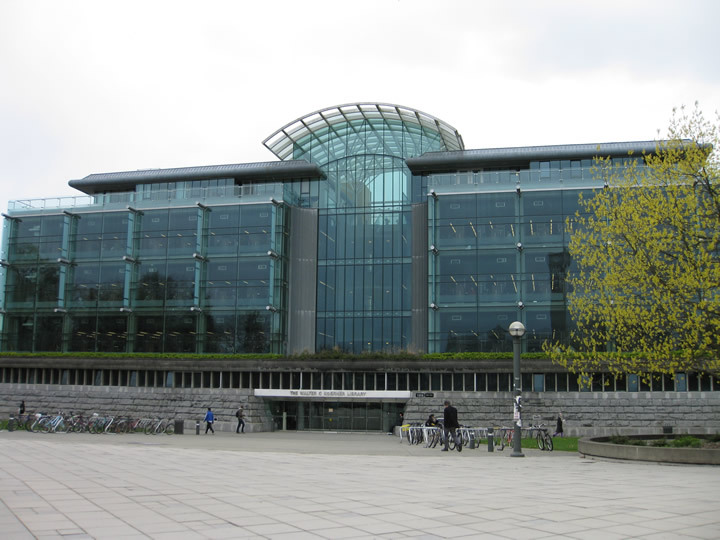 The Kaiser Building, the headquarters of UBC Engineering. 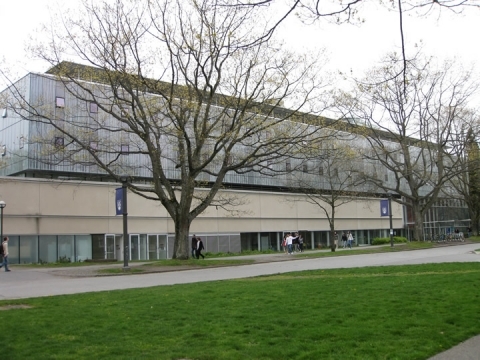 The engineering buildings are located near the south end of the UBC campus along Main Mall and East Mall. The main engineering building is the Fred Kaiser building; this is where the administration offices and first year student services are located. Most of the engineering department have their own building, and engineering courses are also often scheduled in the neighboring buildings such as the Forestry Science Centre, the Dempster Pavilion (belonging to computer science), and the MacMillan Building (belonging to the Faculty of Land and Food Systems). If you’re walking down Main Mall from the north, you know you are close to engineering territory when you see the Cairn, a large, white block of concrete with the letter E painted in red on its three sides sitting on the grass in the middle of the mall. 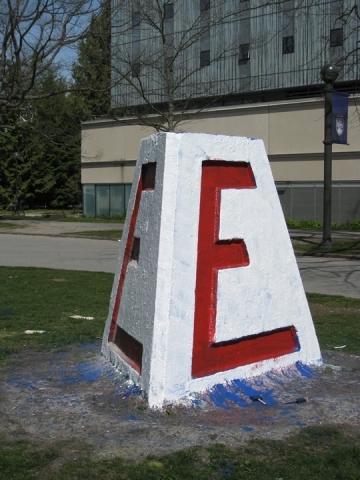 The Cairn is the symbol of UBC Engineering and has a storied history. It is probably the most vandalized object on campus, and is described as a “sacrificial anode” so that people do not vandalize other engineering property. Every time the Cairn is desecrated, the Engineering Undergrad Society will sent a few students out to clean and repaint the monument. The Cairn standing in the middle of Main Mall. It still carries marks (the blue paint near the base) from the last attack against it. The Cheeze, headquarters of the Engineering Undergraduate Society. 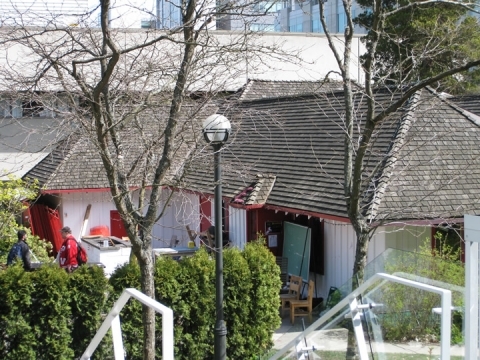 It’s actually the oldest building on the Point Grey campus. The Engineering Undergraduate Society (EUS) is of course the undergrad student society for UBC Engineering. Members of the EUS (and their associates from departmental student societies) are quite easy to spot on campus as they frequently wear the Engineering Red jackets emblazoned with badges. Members can be found hanging out at the Cheeze, a small former cheese factory that’s located in between Kaiser, the McLeod building (electrical and computer) and CEME (civil and mechanical building). As with any self-respecting engineering student society, the EUS works hard to support UBC Engineering students and to organize social events. There are quite a number of events through the school year, including Engineering Week, the E-Ball dinner-dance, and Christmas Caroling around campus. This should dispel any notion that engineers are a group of boring nerds. Nerds? Maybe, but certainly not boring. To further add to engineering’s lively reputation, the EUS is also known for pulling various stunts over the years, and the trademark stunt is the hanging of a Volkswagen Beetle shell off of various objects. The most famous incident occurred in 2001 where a Beetle shell was hung off of the Golden Gate Bridge in San Francisco. However, in 2009 several students were caught in the act by police when they tried to pull the stunt on the Iron Worker’s Memorial Bridge in Vancouver. That probably put the stunt off for a few years, but it’ll make a comeback once the heat dies down. Of course, I don’t really know since I’ve never been an active member of any student organization. To learn more about the interesting history of the EUS and the Cairn, you can visit the hEUStory wiki. In regards to the academics, all first year engineering students take the same core courses. Students go into the departments/program in their second year and take up specializations/options in their third and fourth years. Based on personal experience and what I’ve heard or read, the Faculty of Applied Science generally has a lower admission average than either Science or Commerce. On the flip side, engineering programs generally have heavier course loads. All my friends in science usually took four or five courses per term while I took six or seven, and I didn’t go for any minors or honours options. 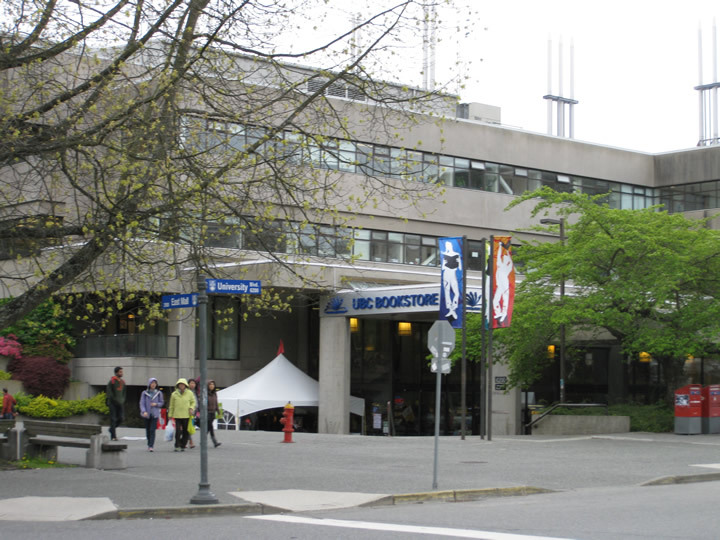 Like most decent university programs, UBC’s engineering programs are not cakewalk, and any student should be prepared to study at least a bit in order to pass. At the very least, students should study for quizzes and exams as they account for the majority of the marks. Assignments are a good way to study, but there’s a limit of how much work one should put on them since they are usually worth 0-10% of the final grade. One advantage of being an engineering student is the option to enroll in engineering co-op. UBC Engineering runs a large co-op program and more than half of engineering students participate in co-op. Enrolling in co-op will usually extend one’s degree by a year (or at least eat up all the summer vacations), but the advantages are numerous. You receive 16-24 months of valuable work experience that you can put on your resume, have the chance to meet people and build up contacts, and make a decent chunk of change. The pay for engineering co-ops is pretty decent; much better than what you would get if you worked in a grocery store. Finding the first co-op placement is probably the most difficult part of the process, but it isn’t that hard especially if your expectations aren’t too high. Once that first work term is under the belt, it’s much easier to find the next placements. As a co-op graduate myself, I highly recommend enrolling in co-op. The UBC Bookstore. Look at all other options before buying textbooks from here. Regarding textbooks: Don’t buy any of the optional textbooks. “Optional” in most cases means “useless”. Actually, a lot of the so-called required textbooks are pretty useless as well, and you should wait two weeks into the term to see if you actually need to buy that textbook. If you are going to buy textbooks, don’t buy them from the campus bookstore if you can help it. The campus bookstore is almost always the most expensive place to buy textbooks. You can buy used textbooks (the bookstore actually runs a textbook classified website), buy it from online vendors like Amazon, buy cheaper paperback or international editions, buy older editions (works sometimes). Even if you don’t want to buy second-hand or online, you can probably find your textbooks at a cheaper price at the Discount Bookstore that’s located about 400m to the east of the campus bookstore, just outside of campus boundaries. Last piece of advice regarding textbooks: don’t bring them to school unless you want to study or your professor/instructor/TA told you to bring them. Textbooks can be very heavy and carrying them for a long time can hurt your back. Food within the UBC campus is not cheap, but less expensive food can be found just outside of campus at the Village (where the Discount Bookstore is located). The Village just to east of University Blvd. and Westbrook Mall. Walking there is pretty easy when it’s not raining, but not as easy when it is. The number 99 B-Line bus and some of the trolley buses stop nearby though if you don’t feel like walking. There is actually a lot of free food on campus if you know where to look: just attend the recruitment presentations from various companies and there is usually free food. Being the member of certain clubs and organizations also gives you access to food as well. Interesting fact: There are four Starbucks, two Tim Horton’s, and a slew of other coffee places on campus. You won’t have to go far to get your coffee fix at UBC. Another fun fact: UBC is known for producing beauty pageant winners in the Chinese community. To date UBC has produced five Miss Hong Kongs and three Miss Chinese Internationals. Does that mean UBC has a lot of attractive Chinese females? Possibly. Given there are over 45,000 students on the Point Grey campus and a large number of them are Chinese, it wouldn’t be a surprise. Don’t take my word for it though. An interesting website for any current or potential UBC student to visit is the Office of Planning and Institutional Research (pair.ubc.ca). In this website you can a lot of data about UBC’s financials, faculty, students, and perhaps most importantly historical course grade data. You can find out the statistical distributions of grades for courses from 1996 onwards, and you can use this data to tell which courses are easier and perhaps even which instructors give higher marks. Whether if that’s of any use or worth the effort is up to you. Places one should visit as a UBC student: The Museum of Anthropology, the Nitobe Memorial Garden, the UBC Botanical Garden, and the upcoming Beaty Biodiversity Museum. Entrances are free for UBC students but not the general public (not sure about Beaty since it hasn’t opened yet). Other than the places that require admissions, any student should take a stroll or a campus tour around UBC on a nice sunny day. More photos of UBC can be found in my gallery. If you are referring to programs such as electrical, computer, civil etc., then no I have no idea what the cutoffs are. You do get to rank 2 or 3 programs though so if your grades are okay then you can probably get into a program (although not necessarily your first choice).